The proposed statue design unveiled last week by members of the Evanston Arts Council. The statue would honor and acknowledge the legacies of local women leaders. 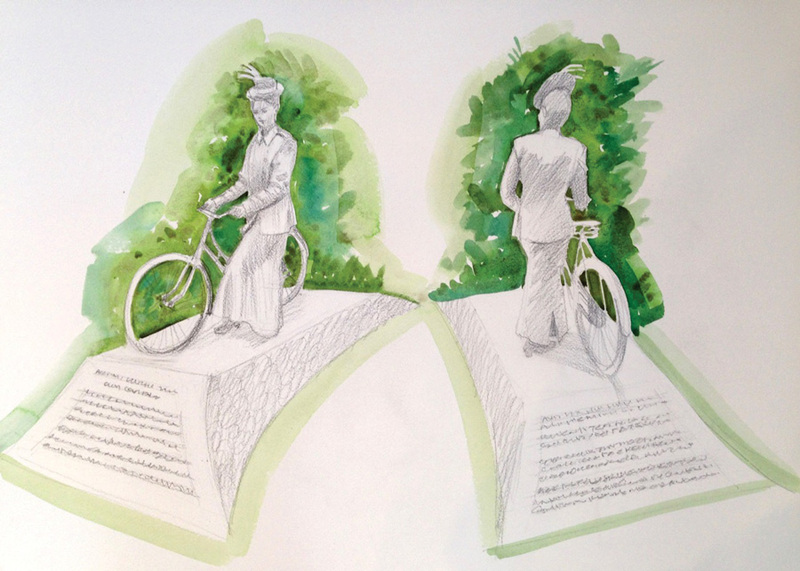 Members of the Evanston Arts Council unveiled plans last week for a new statue to honor and remember the legacies of local female leaders. The stainless steel statue would feature a young woman dressed in clothes from the early 20th century posing with a bicycle. It would be located in a park along Sheridan Road, Evanston Arts Council member Gay Riseborough said. She said she hoped statue would be installed before 2019, which is the the 100th anniversary of Illinois’ ratification of the 19th amendment, which granted women the right to vote. Riseborough said she and fellow council member Carole Bass (Communication ’82) wanted to commission a statue to honor influential female leaders from Evanston’s early years. She said her original idea to represent Frances Willard — a women’s suffragist — has been broadened to include a variety of female leaders. “Evanston women were so important in the struggle for women’s rights,” Bass said. Soon after moving to Evanston, Bass said she realized residents did not know much about the “astonishing history” of women in the city. “It just seems obvious, once you start looking into things, that it would be wonderful to have public artwork in Evanston that would help to further the visibility of the history of women in Evanston,” Bass said. Because the Evanston Arts Council does not have enough money to pay for the statue, Riseborough said she formed a nonprofit to raise additional funds. Once the project has been paid for and completed, the nonprofit will be shut down, she said. Riseborough said though she and Bass have not yet named an artist, a Canadian sculptor has expressed interest in the project. As for the design, both she and Bass said it is important to combine historical accuracy with modern design. Riseborough said they decided on using stainless steel for the construction of the statue because it is simultaneously “permanent” and “full of life” due to its reflective nature. The pair opted to include a bicycle in the statue to symbolize newfound independence for women in the era, Riseborough said. She said the base of the statue may include quotes from Willard such as, “The world is wide, and I will not waste my life in friction when it could be turned into momentum,” as well as text about other female leaders. Bass said she has created a partial list of women to include but will work with the Evanston History Center to finalize the names. Bass said she has been working closely with community organizations and Ald. Judy Fiske (1st), and has received positive feedback.